The reviewer borrowed this book from her school library. If you're looking for a book to introduce children to the world of gardening, this book may be just what you need. 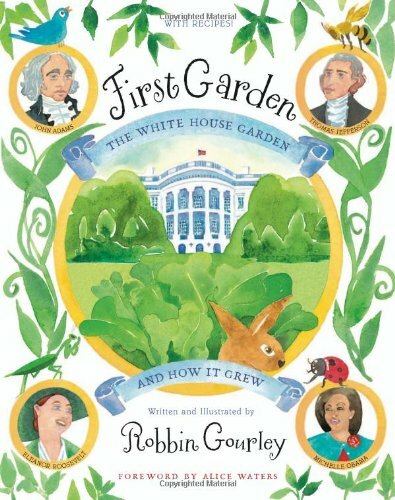 Robbin Gourley follows Michelle Obama's quest to create a garden at 1600 Pennsylvania Avenue in First Garden: The White House Garden and How It Grew. Before readers learn about Mrs. Obama's garden initiative, the author outlines the history of gardening at the White House beginning with John Adam's garden in 1800. Numerous presidents and first families tended gardens including Thomas Jefferson and Andrew Jackson. Eleanor Roosevelt planted a victory garden during World War II, although young readers will need some explanation of victory gardens because a definition is not provided. Most of the watercolor illustrations complement the story nicely, however a few illustrations of people are awkward. After a brief history of White House gardens, the story returns to Mrs. Obama as she enlists the help of local school children and chefs to prepare meals made with vegetables from the White House garden. Colorful illustrations of vegetables and herbs adorn recipes in the back of the book along with a list of reasons to garden. Children will enjoy learning about the history of Presidential gardens while gaining an understanding of the importance of fresh, locally grown food.